My friend Patsy has a sister who has a boyfriend who is a hobby farmer of sorts. Not sure exactly how that works, but they have about a dozen lambs every year, which they kindly distribute amongst friends and this year, I was one of the very lucky ones to receive the mail about the lambs. This is a first for me and in the excitement I have been spamming Patsy with e-mails about when the lambs would arrive. It felt like the waiting was forever, but they did arrive in the end and I got myself one and filled up both my parents' and my Sister's freezers with the thing. Everything was quite civilized and the lamb arrived cut up into pieces or minced and in bags and frozen. What I couldn't find out is if it was a boy or a girl, but apparently they are all called Helmer or Helmina respectively. Perhaps for the best. So on Lundulph's first visit after this marvellous event, I took out a bag of beautiful chops and my Mum dug out a new recipe book, which she believes to be Greek, but which actually just has a collection of fairly simple and rather tasty sounding recipes. The one I selected was called Lamb Cutlets with Rosemary. But my personal opinion is that if you are putting lamb and rosemary together, then there is no way you can skip the garlic. So I added that too. Turn on the oven to around 80 degrees C and place an oven-proof dish with a lid to warm up. Place the chops on a plate and rub with garlic and press in the rosemary, 1 tsp per chop per side, and let stand for 15 - 20 minutes. Heat up a little olive oil on high in a pan and put the chops in, but don't crowd them. Turn the chops over when they have a bit of colour and season with salt and pepper. Depending on how thick they are and how done you want them, you may need to turn them a few more times. Moments before removing the chops from the pan, pour a little white wine over each, perhaps about a tbsp or so. Remove the chops and put in the oven-proof dish to keep warm while you do the next batch. Squeeze a little lemon before putting the dish back in the oven. When all the chops are done, pour some more white wine to deglaze the pan, and bring to the boil to reduce the liquid and concentrate the flavours. If too thin, stir a tsp of cornflour in cold water and add to the gravy, it should thicken up pretty quickly. With these wonderful chops, we had baked potatoes and salad. I was intending to take a photo, believe me, I had my camera ready and everything, but it smelt so nice, once everything was served we all just tucked in. 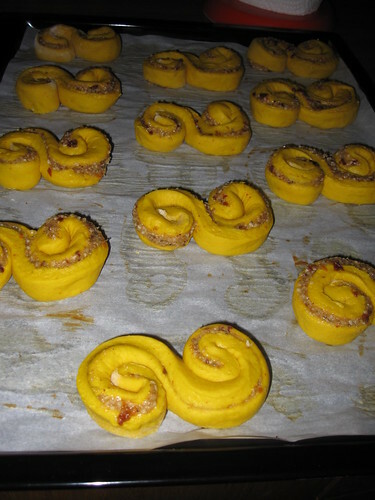 But this recipe was well intriguing - combining the traditional ginger snap with the traditional saffron bun. 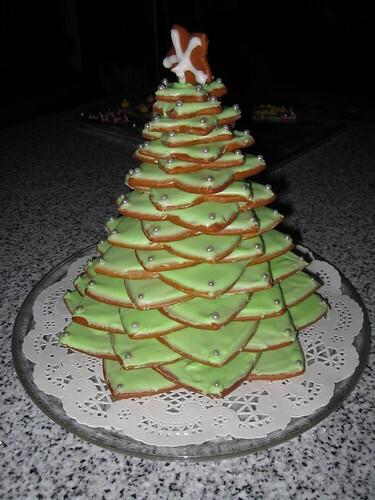 So very appealing in my buzzword driven world at work - streamline Christmas into one easily manageable thing to eat. Reading the details, it's actually not a straight forward combo of the two types of dough, but the ginger snappy bit is actually ground almonds mixed with the traditional spice mixture used for ginger snaps, orange zest and lots of sugar. However, as Doctor Cutie and Bip were invited and are allergic to nuts, I opted to leave out nuts completely and used sesame seeds instead. It worked a treat last year for my macaroons. 1 egg lightly whisked with a pinch of salt to use as egg wash.
Make the egg wash first and let stand in room temperature until needed. Whisk together the butter and syrup until fluffy. Warm up the milk to 40 degrees C (warm to the touch). Crumble up the yeast in the bowl of your mixer, then pour the milk over it and stir to dissolve completely. Add the saffron to the yeast mixture, then follow with the egg and a couple of tablespoons of the butter mixture. Add 11 dl (that's eleven!) of the flour and mix quickly to a smooth and very soft dough. Cover the bowl and set aside to rest for about 40 minutes. Zest the orange and press out as much of the juice as possible afterwards. Place the orange juice in a small pot together with the raisins and bring to the boil, then remove from the heat and let cool down, then blend to a smooth paste. Grind the sesame seeds as finely as possible. Combine all the filling ingredients to a paste. Go back to the resting main dough and add the remainder of the butter mixture and the rest of the flour and work to a smooth and elastic dough. Take out of the mixing bowl onto a floured surface and divide in two equal parts. Roll each half to a square of about 40 x 40 cm and spread out half of the filling over half of the square surface. 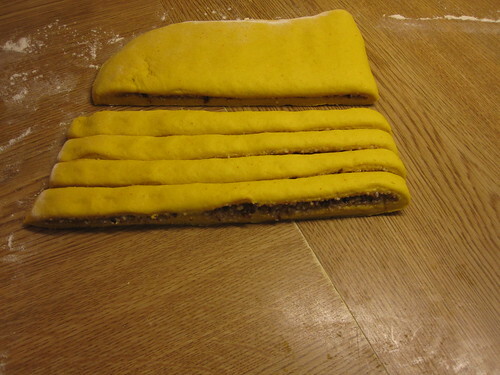 Fold the dough over so that the filling ends up in the middle, then cut strips of about 2 cm width. Line 3 large sheets with baking paper. Form S shapes from the strips by standing them on one of the long cut edges, so that the layers are visible. Place on the sheets, but not too close together. Once a sheet is full, brush with the egg wash, cover with cling film and set aside to proof until double in size, about 30 minutes. Pre-heat the oven to 225 degrees C and bake in the middle until golden brown, about 10 - 13 minutes. When done, remove from the oven and let cool on a rack. These are best served on the same day as they are made. They ended up fairly big, which my Dad liked, as they were closer to the size of the ones you get in the shops, rather than the tiny ones my Mum normally makes. Another benefit was that the technique of rolling out the dough made the process of shaping so much faster than the normal one, where the dough needs to be rolled into strips, cut to a good length and then shaped. I served these at my glögg party, but along everything else that was very sweet, I don't think I did any one any favours. I haven't adjusted the amounts above. Also a word of warning on the light syrup. This is the stuff that is sold in Swedish shops and can be replaced by liquid glucose I guess. In the UK I would have used golden syrup, but that is very much sweeter than the Swedish stuff, so I would have reduced the amount by quite a bit. For some reason my Dad didn't like the final result, he thought it tasted funny. But it seems he is alone in this, I thought they were lovely and it seems that others thought so too. Though they did end up rather sweet and next time I should reduce the amount of sugar in both the paste and the main dough. 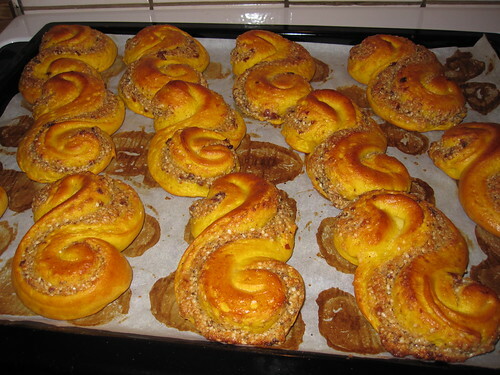 I did take some to work along with brioches and the lussekatter disappeared a lot quicker than the brioches, despite my boss' heroic work on the brioches. I think he put away 3 with clotted cream and jam. 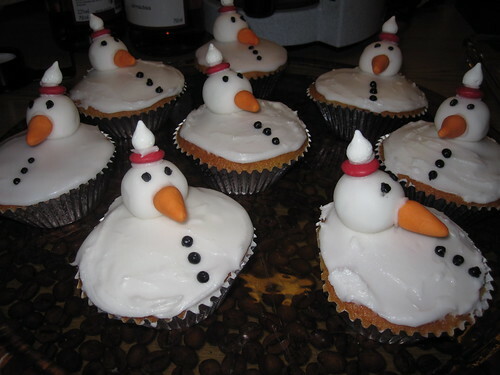 Although the global warming thing seems more obvious than ever at the moment, with birds singing and nesting in the UK and daisies and roses blossoming in my parents' garden in Stockholm, I thought it would be a good way to start the festive season, by making melted snowmen cupcakes. These were submitted by a fellow contestant during my brief stint on Art You Eat a couple of years back and they went straight on my to-bake-list. It is also the reason why I raided Lakeland the other week-end, when I was in the UK - I needed silver cup cakes. Needless to say I bought a lot more things than planned. I also was wondering where I could get hold of cranberries for the recipe - I've not made any muffins in maybe 20 years or so. And then I've only used Doctor Cutie's recipe, which is brilliant, by the way. Mum suggested I use the frozen lingonberries she keeps in the freezer. Why not? It's actually better, because cranberries come all the way from America and the lingonberries are pretty much the European version of them. Another curious thing was the use of clementine zest. It's not at all as easy to make as from lemon, lime or orange. And after zesting one, I had so little to show for it, I zested two more. But it was very nice to smell - different and slightly sweeter than orange. Cream together the butter, sugar and vanilla, then cover and set aside. In a separate bowl, mix the flour and baking powder well. Add the eggs to the sugar/butter mixture, one at a time and with a tablespoon of the flour mixture and incorporate well, before adding the next one. Finally stir in the frozen lingonberries and the zest carefully, just enough to distribute them evenly in the mixture. It will go a bit stiff, as the berries will cool it down. Place paper cupcake cases on a baking sheet and spoon or pipe in the mixture, careful not to overfill, which is what I did. I think about two-thirds should do it. Bake in the middle of the oven for about 20 minutes, keep an eye on them, so they don't go too dark on top. At this point they are ready to eat, but the decorating part is just as fun to do, so why stop here? 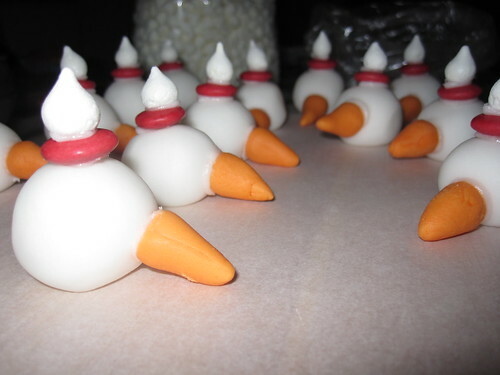 This particular decoration requires two types of icing - a fondant, which is malleable and can be shaped. I bought this ready made. It also came in different colours, I bought a white one and an orange one. For the hats, I used red Non-Stop buttons - they are the Swedish version of Smarties. The second type of icing is a liquid one for pouring, but should be made very thick by mixing small amounts of water into icing sugar. The idea is to scoop this over a cup cake and let it run down towards the edges, but it should be so thick that it dries as it is about to run over the edges. That will give the illusion of a melted snowman. Here is where I made a mistake and gave in to the pleas from my Mum and Bip - to use up the icing we had made for the gingersnaps, where icing sugar is mixed together with egg white. This had to be spread with a spatula and didn't run at all. Only the last two muffins got the proper icing, as the egg white based one ran out. Once again I need to learn to stand my ground when someone tries to persuade me to do something I know is wrong. December is the time of parties in Sweden - everyone does "Julbord" and "Glöggfest", so why should I be different? So I sent out an invite to my dear friends and started planning on what to do. Needless to say, I have been busy at work and had absolutely no inspiration whatsoever as to gingerbread houses and so did not do anything for the competition held every year by the Architecture Museum. Such a pity, this year the theme was actually a good one, "Pride and Prejudice". But flicking through my notebook, I came across a recipe I must have found last year. For Mulled Wine with chocolate and chilli. Unfortunately I had not written down where I saw it, so I can't provide the source, sorry. Heat up the wine with all the spices on low heat and allow the flavours to develop. Add the sugar and let it dissolve. Finally stir in the cocoa. Unfortunately I had written down the recipe in Swedish and I don't know if it was my translation sloppiness, or just not thinking things through properly, but I interpreted the cocoa part as chocolate. This resulted in me grating finely 50 g of 86% dark chocolate, which took a while, as I didn't want to get it melting on my hands or everywhere in the kitchen for that matter. It also meant that it didn't dissolve properly in the mulled wine and I ended up with some sort of sludge, which I personally quite liked, but which no one else seemed to enjoy as much. Bip bought a ready made version of this and said it had cocoa powder in it and had tasted very nice. So this recipe is one where I need to keep working on. Besides, the chilli was barely noticeable, even if I used one of the ones we grow in our kitchen, which are very hot. Just to be on the safe side, I also made traditional mulled wine, with a packet of spices. That was a lot more popular. No photos unfortunately, I did take some, but they didn't look pretty at all. This year, we started early on the Christmas baking, mainly because I made yet another visit to my local Lakeland shop and couldn't resist a new gadget - a set of 12 star shaped cookie cutters which make it possible to create a Christmas tree. In addition, I managed to dig up my Mum's old cookie spritzer and after some googling, I decided to merge the spritzer cookie experiment with the gingerbread making. Using my usual recipe, but with 11 dl of plain flour, rather than 13, Bip and I made enough starts for the Christmas tree and also 3 big trays of spritzer cookies. It was tricky at first, but once we worked out the technique, we just kept stamping away. Sadly I forgot to take photos, but on the whole, spritzing worked pretty well. One thing to keep in mind is not to put any raising agent in the dough if using the spritzer. Since I had prepared the dough before I read this instruction, it was a bit late and the cookies lost some of their shape in baking. This also goes for the stars for the Christmas tree. My Sister Bip made the icing and she's got a pretty good hang of this. 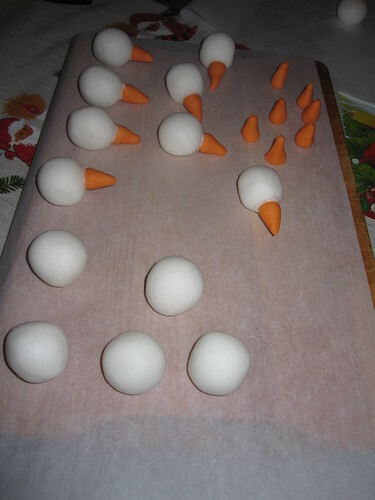 As we were decorating biscuits, i e hard and crunchy things, the icing needs to be made with egg white. We also established that it takes quite a lot of green food colouring too, we decided to stop at pale green this time. I should maybe try some green gel colouring from the sugar craft shop, that might give a stronger colour. My original plan to first coat each star and then stack would have taken too long, so I did it on the fly. 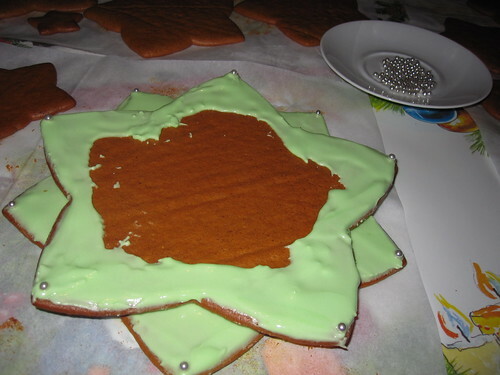 I also decided not to coat in the middle, to save on icing. It still ran out and Bip had to make a second batch, but clever as she is, she managed to get the exact same shade! 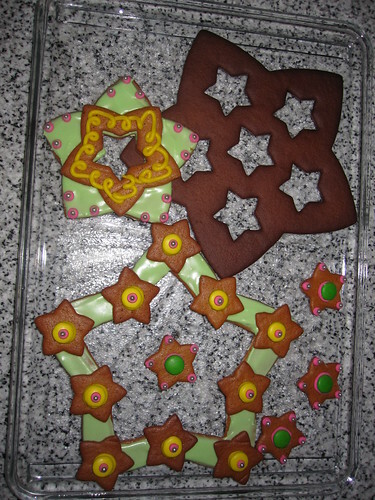 And when you have all these different sizes of cutters, it was not possible to resist experimenting a bit with them. On the whole, a very pleasant way to spend the evening.